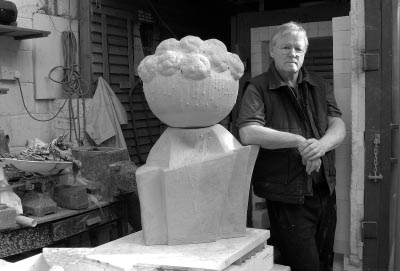 BOB DAWSON COASTAL SCULPTOR. Bob Dawsons Sculpture's have been inspired by environmental and maritime issues taken from studies of the South West coast line. Available in ceramic and bronze, they are extremely tactile and rich in surface texture. These abstract works combine natural and manmade forms. They are ideally suited to alfresco and corporate gardens, or in open office space. Clients can choose from small runs of limited edition of one - ten or by private commission. 2011- St Ives Society of Artists Exhibition/ painting and Sculpture. Organised Dartmouth Contemporary Arts Exhibition Of Sculpture at Buckfast Abbey. South West Sculptors Joint Exhibition With Breton Sculptors, Totnes, Devon DCA- Dartmouth Contemporary Arts Exhibition, St.Petrox Church, Dartmouth. The South West Coastal Path. 7th July - 15th June 2007 S.W. Sculptors EXH. Dartington. April-July 2006 Exeter University, Golden Jubilee Celebrations Exhibition.